One of the things I look forward to most at the farmer’s market are fresh tomatoes. With 30 degree weather still in the air (and a few snow flakes here and there), it’s hard to believe it’s actually Spring, and although there is already an abundance of asparagus in the stores, I’ll have to wait a few more months for some farm fresh tomatoes. Boxed or canned tomatoes are of course available year round, so I stock up on these pantry items during the off-season. 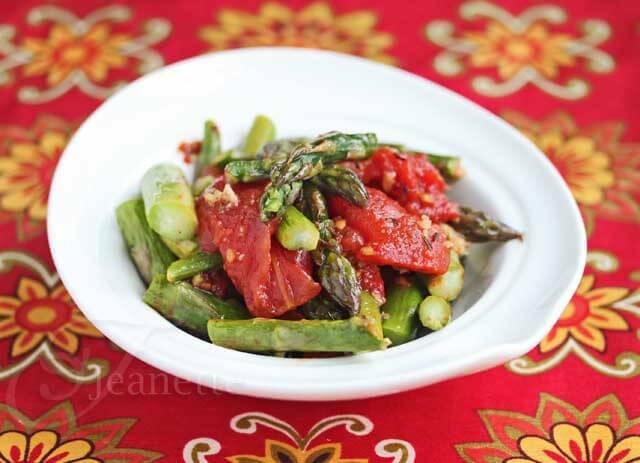 The other night, I was craving Roasted Asparagus and Tomatoes that I usually make using fresh cherry tomatoes. No worries, I just oven roasted some canned whole tomatoes that were drizzled with olive oil, Herbes de Provence, minced garlic and a little salt. I tossed in some asparagus as well, and voila, I had a simple, pretty vegetable dish for dinner. This is an easy recipe and fits perfectly into the Mediterranean Diet and would be perfect as the vegetable component of MyPlate. There’s really no reason you can’t eat healthy and enjoy your food. This is a quick and easy vegetable dish that requires little attention since it's cooked in the oven. Of course, if you can get your hands on some ripe, fresh tomatoes, use them instead of the canned/boxed tomatoes. Preheat oven to 375 degrees. Drain tomatoes and reserve liquid for another use. Split open tomatoes, remove seeds, and place on a parchment paper lined baking sheet. Drizzle with 2 tablespoons olive oil, and season with Herbes de Provence, salt and pepper. Bake for 15 minutes. Toss asparagus with 1 tablespoon olive oil and salt and pepper, to taste. 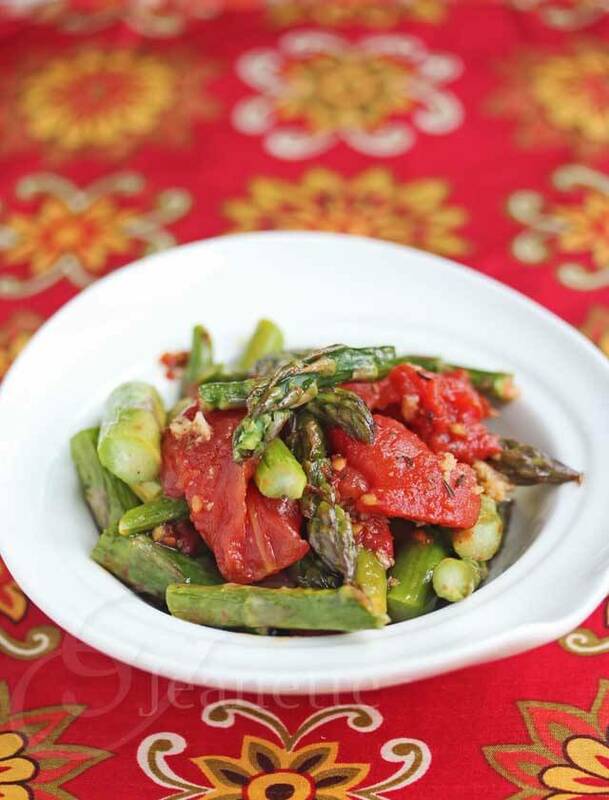 Place asparagus on baking tray with tomatoes, making sure vegetables remain in a single layer. Bake 15 more minutes. What a mouthwatering spring or summer side! This looks so delicious! I love the simple, no-fuss flavors, too. This looks divine. I plan to add this to my summer salads….I had to pin it! Joan – this is so easy, great idea adding it to summer salads! Thanks for the pin! I’m so excited about asparagus being in season again–it is one of my favorite vegetables! This looks like a delicious way to prepare it! I’m holding my breath until asparagus season here in Rhode Island — another month to wait. There is nothing like farm fresh asparagus (except, maybe, your own asparagus patch)!